This whole aspect of these two forty-day counts from either Yahshua’s water baptism or His resurrection that was introduced in the last posting, is extraordinarily interesting, revealing, and affords added hope. And as we noted, both of these counts immediately followed His baptism—the first by John, and the latter in true death, burial, and resurrection. Let us review these. The first of these two counts began immediately upon Yahshua’s baptism by John on Atonement. We read in Mark 1:12 that “immediately” the Spirit led Him into the wilderness. This would have been day one in the count of forty days and forty nights (Matthew 4:2). He was brought out of the water, and immediately the forty-day count began. The latter count of forty followed Yahshua’s truest baptism when He died, was buried, and resurrected from the grave after three days and three nights (Matthew 12:40). Once again, His resurrection would have been day one in that count. Acts 1:3 tells us that He then presented Himself to others for forty days, and on the fortieth day ascended into heaven. Therefore, once again He was brought out of death, and immediately the forty-day count began. Now, you will notice something very interesting about these. In both cases, not are these only like forties, but also similar forty-threes. When Yahshua came out of the wilderness after forty days, we learned in the last posting that He went back to the Jordan, stayed there a second day as well, and then on the third day went to Cana where He turned the water into wine. Therefore, in this first case we see that it was in fact a specifically accounted forty-and-three period, or forty-three days. Conversely, while it is stated that Yahshua presented Himself to the people for forty days following His resurrection, we likewise know that before this He was in the grave for three days and three nights. So, instead of a forty and three here, what do we find? Once again there are the same numbers, only reversed—a three and forty, for an equal forty-three days. Yahshua not only began and ended His ministry with counts of forty days, but He began it with a forty and three, and ended it with a three and forty. And, the two threes were remarkably different, which we will consider as well. Do you think these specific occurrences are all mere happenstance, or are they divine design that afford revealing truth and understanding? Clearly, this is the Son of God we are speaking of here, THE intercessor for the church, and there is nothing circumstantial regarding His time and work on this earth. Therefore, we are compelled to ask: What could all of this mean? How would this impact us today just before His return? Or more importantly, how might this apply to our lives at this time? Of course what we see here with these former and latter forty-threes is something we have seen evidenced by Yahweh on several occasions—a flip. And as we consider the requirement and outworking of the covenant with the many, there is another flip that takes place as well. While Yahshua began His three-and-a-half-year ministry at Atonement (during the time of Trumpets and Tabernacles), and essentially completed it at Passover; conversely, the Elijah begins his three-and-a-half-year ministry at Passover, and ends it at Trumpets. The latter work is evidenced by John the Baptist, who had the spirit of Elijah and began His work at Passover; and, Paul indicates that the first resurrection when Elijah ascends alive is at Trumpets (1 Thessalonians 4:15-17). However, what we find evidenced in the water being turned into wine is that the Elijah work would begin in the same manner as Yahshua’s Atonement beginning—with a forty-and-three-day period, only relative to Passover. And while Yahshua’s Passover death was a three and forty, His return as Immanuel is via a Passover-initiated Elijah work that is a flipped forty and three. Having seen this clear truth, let us ask another relevant question: What can all of these repeated forty-threes mean? Clearly, they have to be significant as well. In the January 23, 2009, posting titled “The Sabbath Rest,” some of the significant evidences of the number forty-three were addressed. 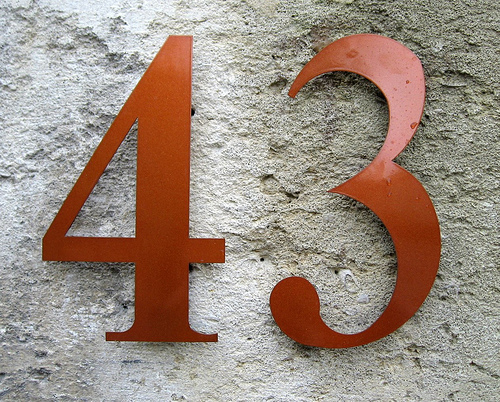 Unlike many other numbers, the two-digit number forty-three is not used in the Scriptures. This does not diminish its significance though, as you will see. Its identity is found in the three-digit number, 430. In Exodus 12:40-41 and Galatians 3:16-17, we find that the descendants of Abraham lived in Egypt for 430 years. Exodus tells us that this was precisely from a Passover to a Passover— “to the very day.” This period was initiated at Passover, 1877 B.C., when Yahweh set forth the critical and highly revealing covenant with Abraham in Genesis 15 when he was seventy. The conclusion of this specific numerated portion beginning on the next day was Passover, 1447 B.C., when the sons of Israel came out of Egypt. The covenant with Abraham was made, and 430 years later “to the very day” his descendants were delivered out of Egypt. First, it is important to realize how profoundly this number, 430, is relative to the split covenant with Abraham. Also, quite evidently, it is intrinsically related to Passover. Furthermore, evidenced by the 430 years in Egypt, as well as Abraham’s age of seventy (the number of years of Babylonian captivity) when the covenant was first made, 430 and forty-three are a time of delay and waiting for Yahweh’s promised restoration and fulfillment. Let us now see how profound and even, as can be expected, consummating this specific matter is for us today. If you count from the exodus eight additional periods of 430 years, for a total of nine times 430 since the Genesis 15 covenant, this takes you to a very hopeful date—1994 A.D. Nine is not only the number of the Elijah, but also the number of completion. The gestation period of humans is nine months, and nine is the final count in single-digit numbers, leading to the higher dimension double-digit ten, which is Yahshua. As you are aware, 1994 is the very year that the Spirit came upon me and began revealing this incredible Bride truth. What does this mean? It means that in 1994, not only could the true fulfillment of the covenant attested with Abraham begin to be revealed for the first time ever, but also that the concluding covenant parts could now be laid out, bringing the covenant’s complete long awaited fulfillment. Do you realize how hopeful and even profound this is? It is extraordinarily significant that the covenant pattern of the church—first Remnant –> Christianity –> second Remnant—was revealed to this man for the first time ever precisely in 1994. That which was laid out in type and promise in 1877 B.C., 9 x 430 years later was revealed in 1994 A.D. with the purpose of adding the culminating portion of its true fulfillment. But something happened just like before. As we noted in the closing of the last POSTING, this work that began in 1994 had its own breach—from June/July, 1994, to 2009. And strongly adding further hope, this is precisely what took place with the descendants of Abraham. They left Egypt at a 430-year count, but their promise to enter Canaan was breached for forty years. In like manner, the Bride work that began at a 9 x 430-year count in June, 1994, was equally breached and looks to enter into Cana for the wedding feast in 2009. Again, this is quite hopeful for us today. And even now I/we face another attesting 43 count, this one from Passover, April 25, to my wedding anniversary on June 6. *Passover, 1877 B.C. –> 430 yrs –> Passover, 1447 B.C. –> 8 x 430 yrs –> June, 1994 A.D.
What is our hope? That this like attested delay will give us what, in truth, began in 1994. But also keep in mind, as summarized in the last posting, June 6 has multiple ties that go back to Trumpets, 2008, as well. Again, the covenant with Abraham was a type of the covenant that Yahweh makes with man through the church—the split covenant parts of the two Remnant, separated by the body of Christ. Hopefully, that which Yahweh began with this man in 1994 and was equally breached, will now be fulfilled—the establishment of the second-part Bride. As did Abraham and Rizpah, I have guarded those covenant parts for fifteen years. Also, you will notice that this promise began with Abraham on a Passover, was fulfilled 430 years later in type on a Passover (the exodus), and we are now looking to Yahweh to give us the fulfillment of the Elijah work forty-three days following an exceptionally significant April 25 Passover. With the testimony we see relative to the exodus, what does this speak to us today? That the Bride will come out of spiritual Egypt, Christianity, and enter into the Promised Land, the Millennial reign. Again, both of those were Passover-related events that are related to the Passover-initiated Elijah work. It is important to see here as well that unlike Pentecost and Jubilee that adds the feast after the delay count, in this count the last day is the fulfillment. For example, Passover in 1447 B.C., when the descendants of Abraham came out of Egypt, was on year 430. Likewise, 1994 was the fulfillment of the 9 x 430 count and not 1995, the year following. Relevant to us at this time, June 6 is the forty-third day in the count of 43 from Passover (Passover included). Additionally, we addressed in “The Sabbath Rest” that Yahweh’s creation period for His heavenly kingdom is 43,000 years. Here once again, the fulfillment is in the 43,000th year. As attested in this macro count, the forty-third is in truth a promised and long awaited Jubilee. Thus, in the case of 43,000, 430, or 43, the fulfillment is inclusive in the count. And might we mention here that second-Remnant-attesting George W. Bush, the ninth in the sequence of presidents initiated by William Henry Harrison, seven of whom died in office in twenty-year election cycles, was the forty-third president. It is also noteworthy that Harrison was the ninth president of the United States. In the next posting, we will consider the significance and possible impact today of Yahshua remaining here on earth for the extra forty days following His three and a half year portion of the covenant with the many, as well as the hopeful significance of the water being turned into wine, and the six stone waterpots.